Whether it’s a shady contractor, an accidental hole in the wall or even a shocking shade of pink – a design disaster can (and probably will) affect us all. And a design disaster in the bathroom can mean serious trouble. Renovating a bathroom or kitchen are two of the most costly projects in the home so if it all goes wrong, you’ll need an escape plan. And quickly. If you’ve budgeted carefully then you may have enough money left over to purchase something else more to your taste. Obviously, this isn’t ideal but if you feel like you hate it so much that you absolutely, positively can’t live with it – it may be your only choice. It’s better to do it now than at a later stage. Due to the large costs involved in fittings and furniture and if like, most, you don’t have enough spare cash to get something else then you will have to finish the job. If it’s the colour you dislike then paint the wall in a shade closely related to the tones of the furniture to compliment the look and add colourful accessories or introduce a feature colour to brighten it up. There are plenty of virtual colour painters online where you can upload a snap of your bathroom and choose the most appropriate colour to go with it. It’s not perfect but it could give you some ideas of how to liven the room up. Consider painting the walls or your vanity to match with the rest of the room. Experiment with some fresh patterned tile to lived it up. If you’re feeling extra brave, then why not consider a weekend DIY project and upcycle or purchase a second-hand dresser and transform into a custom-made vanity. Play with the accessories in the room to create a focal point elsewhere. Look closely at your light fittings and fixtures, your mirror and your towels. Install a few sconces, frame your mirror, add some artwork and pick some really funky towels and shower curtain to match. By playing around with the little things – it should, at least, make the room feel a little bit more of your own. Try to stick to neutral shades and colours when planning your bathroom renovation. Don’t go for anything too wacky – you might really want a toilet that doubles up as a sink – but when it comes to selling your home, funky gadgets and colours aren’t to everyone’s taste so it will mean more expenditure for a buyer and ultimately, a lower price for you. Don’t buy products without seeing them in person. 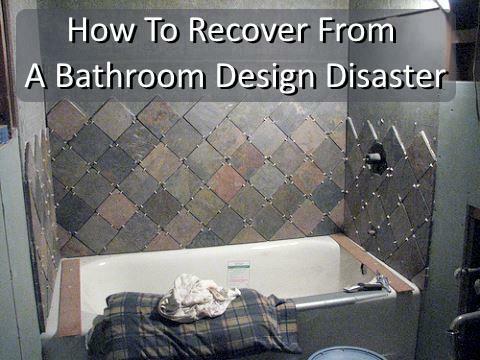 It could mean the difference between a perfect bathroom renovation and a design disaster. The bathroom renovator’s worst nightmare. Mould. If It’s a small area of mould (less than three patches, each smaller than a metre each) you should be able to tackle it yourself. Grab your goggles and a dust mask and get to work. Clean and disinfect the area thoroughly – but don’t use bleach! Get rid of any materials which have mould damage, unfortunately these will have to be replaced. Once the area is clean and dry ensure that the cause of the mould i.e. a leaky pipe has also been addressed to prevent the problem reoccurring. For larger mould patches, you will have to call someone out. You could call a floor contractor to repair water damaged floors, then contact a builder to repair the interior walls and then get a plumber to solve any leaks but this could mean waiting around for a long time for each stage of the work to be completed. Alternatively, call a bathroom remodelling expert or an environmental consultant to assess what you need to do next. Remember, mould damage can really harm the value of your home and some types of mould are highly toxic so don’t ignore it. There’s no quick fix for this one, regrettably. Inspect the bathroom thoroughly before undertaking a bathroom redesign. Check the shower, bath, toilet and vanity. Feel around for any soft or moist patches. Check for water stains. Use a flashlight to help you look closer and if you do find spots of moisture, then call in an expert to do further tests. They can check for mould, even when it is unclear if you have it, using specialist devices. Take precautions after the mould has been removed. Ensure your bathroom is well ventilated and invest in a fan. When cleaning, clean your bathroom with mould-killing products. Check your home insurance as some insurance companies will cover mould under certain circumstances. If you’ve had some shoddy work done to your bathroom or your contractor has run off altogether, go to the police in the first instance. Give them as much information as possible as the poor work constitutes fraud so they could be subject to a legal case. Next complain to Trading Standards or the Better Business Bureau and finally, you can try to take the cowboy builder to court in a small claims case. Be aware though, as this may take up a lot of time and depending on the amount of the claim – can cost a lot too. Don’t scrimp on workmanship. You can’t make a bad tradesman do a good job but in some instances, you can ensure cheap materials are made to look expensive through the work of a good contractor. If it seems too good to be true (in terms of cost) – it usually is. Shop around, get a minimum of three quotes on the work you require doing. Get recommendations from friends and work colleagues on who they have hired previously – what’s better than a word of mouth recommendation?! Do they have references? Do they have an office and a landline phone number as opposed to a van and a mobile phone? Be really sceptical of cash-in-hand jobs and ensure they give you written estimates for the cost and time frame of each stage of work. Make sure you receive a remodelling contract and ensure you read it carefully. Address them with any discrepancies or things you are unsure of. Make sure you plan each stage of your bathroom remodel carefully. Don’t try to rush any work. Expect that it will take a long time for your bathroom to be the superstar bathroom you desire. Budget more than you need to allow for anything to go wrong. Don’t attempt to do any plumbing or difficult tasks yourself. Save money by painting and undertaking cosmetic tasks. Stick to mid-range fixtures and fittings – don’t cut corners in the wrong places. Remember, if you’ve had a bathroom design disaster – it’s not the end of the world. Read up before you undertake any work and be sure to check out my list of common bathroom design mistakes so you are well equipped to have a smooth and painless bathroom remodel. Everyday, thousands of people trust YouRemodeling to review and find local screened professionals, builders and contractors in your area. Try it out, it’s FREE! Click here to start.